Nils Ericson Central Train Station. Watercolor and sepia ink on 90 lb. hot press paper. Gothenburg, Sweden is on the other side of the world from me & I have never had the pleasure of visiting there but it is this University town where my brother in law lives & works which is why this months Virtual Paintout Challenge caught my attention. A few months ago I found this particular painting challenge which Bill Guffey began in 2009. The idea intrigued me and I have been meaning to try it but this month location gave me the extra motivation to finally put pen and brush to paper. The general concept of the Virtual Paintout challenge is to use Google Street View as source of inspiration and reference for painting and sketching. No matter where in the world you live, if you are lucky enough to have access to the Internet you can cruise the streets from the view point of a camera mounted on the roof of a Google car. While you certainly have plenty of urban scenes to choose from there are also rural landscapes, people or animals to be discovered too. For the last year I’ve been practicing my urban sketching locally so I thought I would be up to this challenge. Once I zoomed in on the locale selected what I came across was very intriguing. I was cruising the streets, peering into alleyways and parks, glimpsing people having lunch in outdoor cafés, passing cyclists and wondering “Are they going to work or school? “. Part of the test is deciding on an image and while you can submit more than one entry they all that you limit it to three per month. Shall I do another or wait to see what neck of the woods Bill chooses next? P.S. I came across this article after I did my painting. They’re so tempting I’m going to need to try some of them too! Next PostNext Back to Sketchbook Skool Homework! I love the rounded perspective. The movement of the figures is a great contrast to the solidity and timelessness of the architecture. I think you should do one of a certain resort town in Bulgaria. 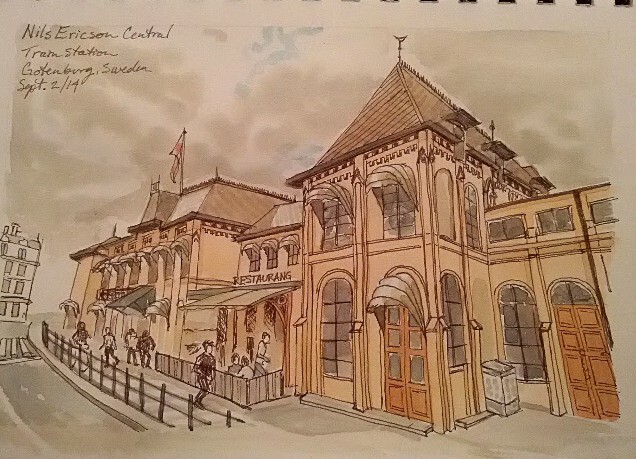 That there is some excellent urban sketching. Good idea, then I’ll feel liked I know the neighborhood when I arrive! This sketch is beautiful, Terri and your attention to the little details is remarkable. You were definitely up to the challenge. The link you provided has an extra “http” so with a little tweak I visited Bill’s blogspot. A lot of different styles and inspiration there and a great idea to bring artists together.